This paper builds upon current debates in land grabbing and agrarian political economy, in the context of Myanmar (Burma). It seeks to provoke insight into how states are both facilitators and promoters of land grabbing, reflecting on the state’s need to accumulate capital and maintain a certain level of political legitimacy in this process (Fox 1993). By critically reviewing the conventional ways of understanding land grabbing, research finds that these definitions/abstractions are unsympathetic to new trends that have the global spotlight in 2008. By recognising the gaps, the role of the state becomes an analytical departure point, and I offer certain conceptual clarifications from a political economy perspective. 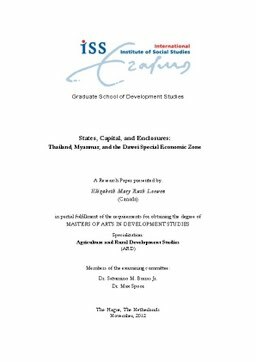 Situating the Dawei Special Economic Zone within current theoretical discussions, it becomes apparent that the conventional framing of land grabbing is limited when attempting to capture this particular case study. It becomes more appropriate to understand land grabs as the capture of control over land by various actors, and emerging out of key roles of the state and the state-capital. Three points can be established about the role of states in facilitating and promoting land grabs: by making land available for investment through its enclosure; by seeking out new ways to satisfy capitalism’s spatial fix through the pursuit of capital accumulation and resource security; and lastly, states promote the free-flow of capital, within and beyond their borders through regional and bilateral trade agreements, as well as state institutions (e.g. the legal system). From this point of departure, we can begin to frame more effective resistance that tackles the underlying processes driving the phenomenon.